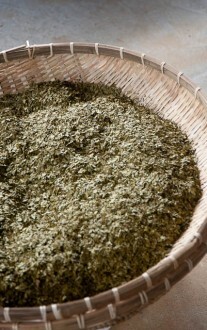 The flavor and aroma of green tea are most significantly affected by roasting. The roast is the last step of the production process, once the leaf is already dry. 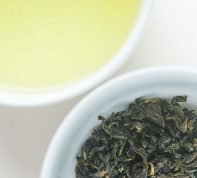 The tea leaves below are our Sweet Roast Green Tea, which optimized for roast flavor. The flavor and aroma are created by the roast, which is dictated by the harvest season. These photos show how the leaves change color during the roast. In the left photo, tea leaves that have been roasted for longer are placed at the front of the tray: this is our ‘dark’ Sweet Roast Green Tea. Our original Sweet Roast is in the middle. In back, the roast is much lighter. 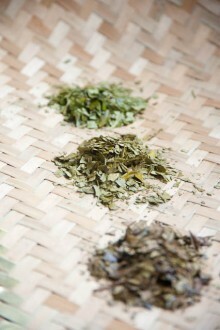 Over the course of roasting, the tea’s aroma becomes stronger and the flavor sweeter. The process is stopped when the tea is between being light and too dark, at the turning point when the flavor of the brewed leaf suddenly becomes sweet. Precise timing is critical. The resulting tea is soothing when enjoyed hot, and quite refreshing when cold. 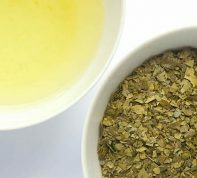 See our blog for recipes on how to include Sweet Roast Green Tea in your cooking! 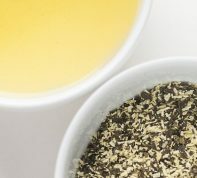 Recently, green tea has gained more attention for its health benefits. Although research continues to show that green tea prevents many of today’s common ailments, its flavor and aroma may play an even bigger role in encouraging our consumption — as sometimes, our enjoyment of tea is what inspires us to consume it.